When I pick up a new order of photos, I am inspired to scrapbook. I was happy to find that a lot of my recent photos paired nicely with the May Studio Calico kit - 35mm. These pics that Kevin took himself with Reese and Rhett are some of my recent favorites. I was inspired by a layout in the new Creating Keepsakes idea book Simple Scrapbooks. 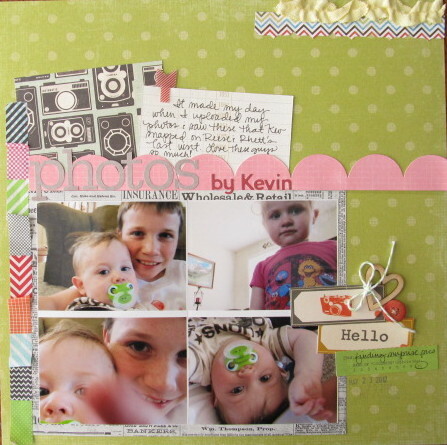 The layout was by Nicole Harper (page 12). 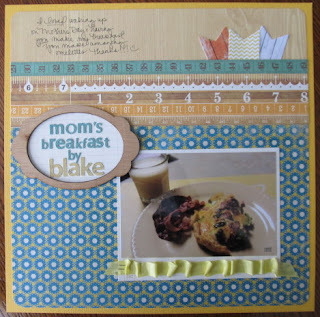 I had to scrap my Mother's Day breakfast that Blake made for me. 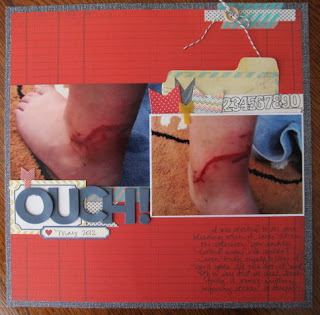 This layout was inspired by a sketch by Laura Vegas on page 19 of the same Simple Scrapbooks idea book. 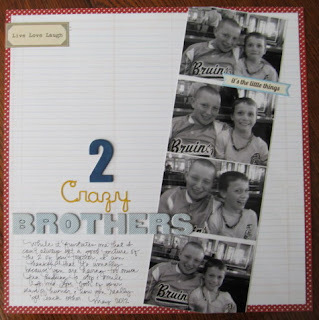 This simple layout was inspired by a Linda Barber layout on page 26 of the same idea book. The pics are of my boys acting crazy at dinner after a ball tournament. I had to convert them to b/w since they were laughing so hard, the pics were a bit blurry! I took a Heidi Swapp flip book apart to make individual sheets behind my photos on this page. I also added some SC wood veneer stars and a chipboard alpha. 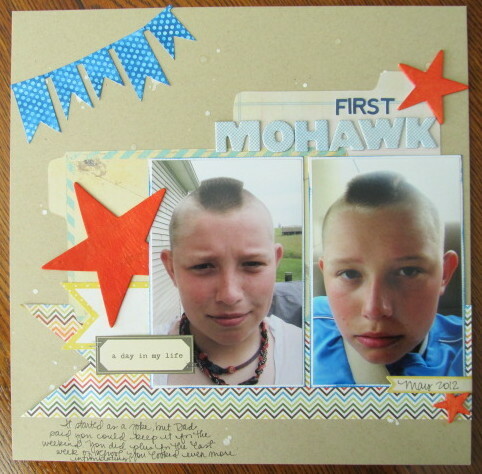 Blake's mohawk started out as a joke, but stuck around for about a week. He's thinking about going back to it. 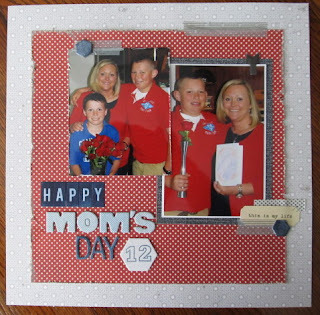 My Mother's Day layout was inspired by Kim Jackson's layout on page 54 of Simple Scrapbooks. I added some SC chipboard alphas, Thickers from an older kit, and Queen & Co. washi tape. Blake came home from school with a nasty cut on his ankle. Of course I had to scrap it! I scraplifted Kelly Purkey's layout on page 44 of the CK idea book Simple Scrapbooks. Added some OLD Thickers, twine, a Jillibean sticker and the numbers cut from a SC advertisement card in a kit. Blake will be the first to tell you that he isn't artistic. 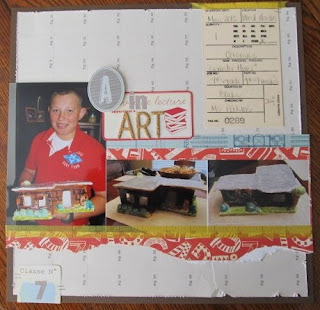 So...it was big news when he came home from school with an amazing art project for which he earned an A!!! Needless to say, I am enjoying my summer vacation from school! I love how you can get so many layouts from one kit. And they all are unique and different looking.